Duilia deMello of the Catholic University of America and NASA Goddard is presenting in the afternoon galaxies press conference. I’m in here reporting while Rebecca edits, and Phil and Fraser are listening to the NASA town hall meeting. In peering around the universe we tend to stumble across a lot of weird small stuff. Blobs of gas. Blobs of stars. Blobs. 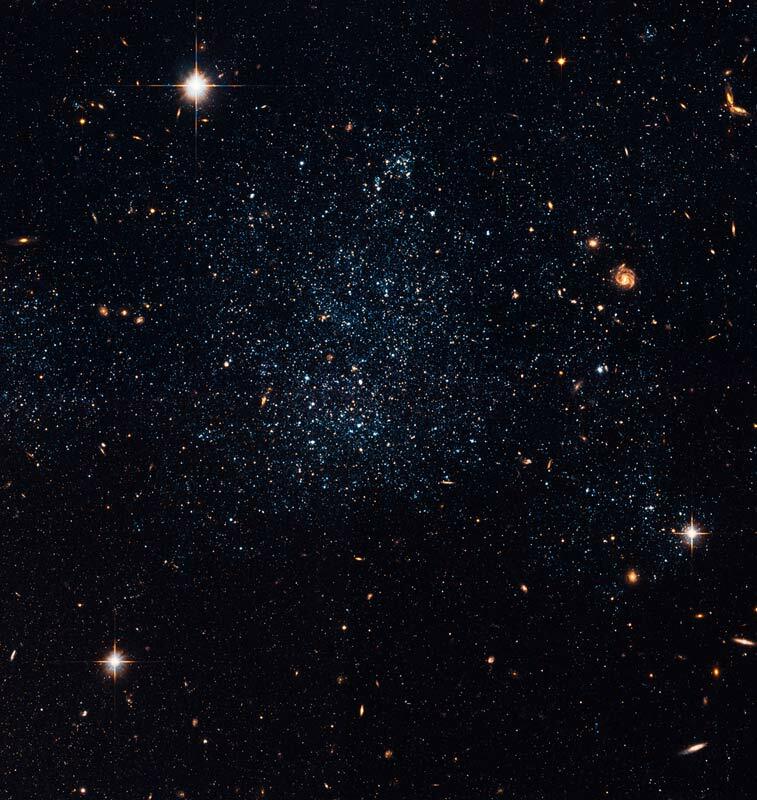 New Hubble images in combination with GALEX ultraviolet images, and archived Hubble data have allowed astronomers to determine that these blue blobs (example at right, dwarf galaxy Holmberg IX) are actually clusters of 20,000 stars â€šÃ„Ã¬ dwarf galaxies newly forming in todayâ€šÃ„Ã´s universe. deMello and her team determined these blue blobs are forming dwarf galaxies by comparing the ultraviolet and Hydrogen Alpha light from these systems to the light coming from objects we understand. From their light profile, it was determined these objects are less than 200 million years old. 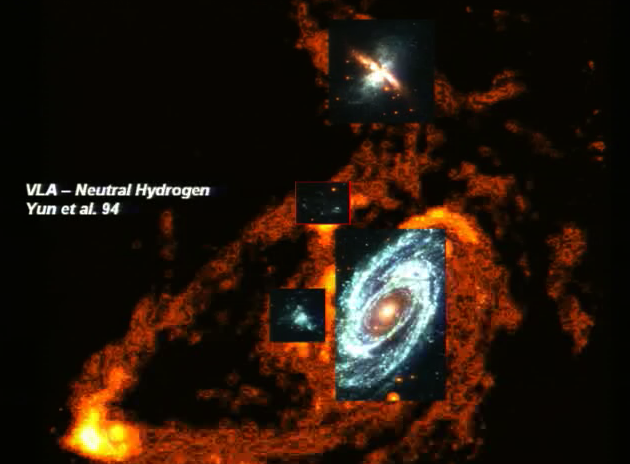 As M81, M82, and NGC3077 interacted ~200 million years ago, material was stripped from each of these systems. As the stripped material coalesced, it formed these new young systems that today are polluting the intergalactic medium – the gas and dust between galaxies – with enriched material like heavy atoms that could grow into the stuff of planets and people. From a splat comes star formation, comes supernova, comes new and interesting science that explains how the heck titanium is found between galaxies. Got to love what happens when galaxies collide. IIRC, M81 is one of the very few galaxies that appear -NOT- to have significant quantities of dark matter. I wonder how that might play into the tidal stream formation. I wonder if tidal tails elsewhere have dark matter components (which we can’t see, of course) and the M81/82 tail would be dark matterless (or partially dark matterless). 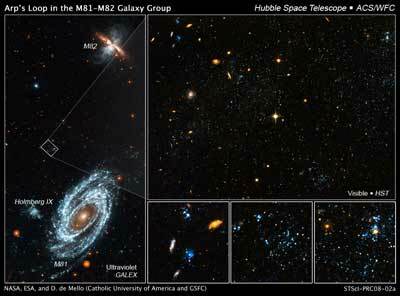 I wonder if the baryonic matter we see there is from M81 or M82 originally.